Spitsbergen-Svalbard.com is again entering new territory. This time, not geographically, but technically. 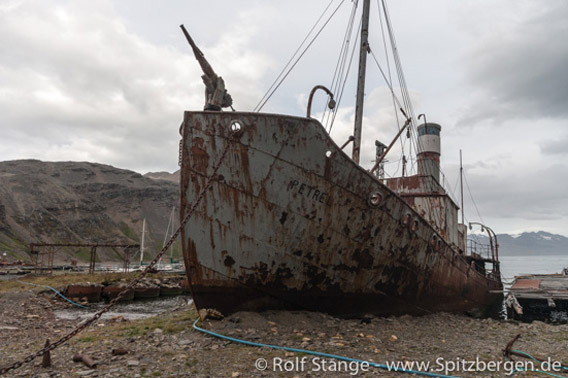 In early 2014, a software has been published that enables me to show you this great virtual panorama tour of Grytviken, South Georgia (more will follow). A virtual walk with 7 stations, including the church and an interactive museum visit. The whole virtual tour consists of more than 20 panos, captured in late 2013. Have fun looking, we appreciate your feedback. The old cemetary is on the western side of King Edward Cove. Most visitors land on the beach under the cemetary and start their walk from there. Whaling was a dangerous business, and those whalers – mostly of Norwegian origin – who died during their work were buried at the cemetary. Together with them rests Sir Ernest Shackleton, who died of heart failure on 05th January 1922 on board his ship Quest which was anchored at Grytviken. His comrades wanted to bring their former Boss back to England, but his widow decided that he should be buried where his heart truly was: in the Antarctic. 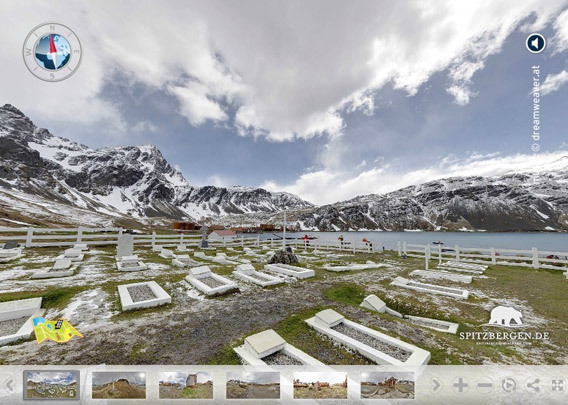 So they returned and Shackleton was buried in Grytviken. 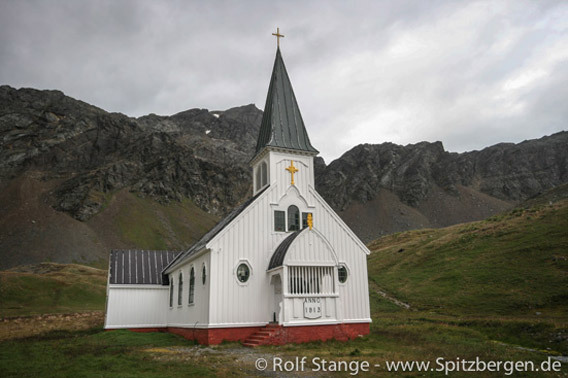 The little pilgrimage to his grave and a toast to The Boss is a tradition for most, if not all, visitors to Grytviken. 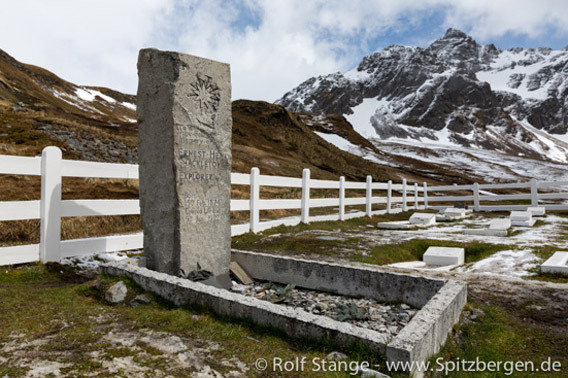 A few years ago, Shackleton’s loyal right hand man Frank Wild, second in command during the famous Endurance expedition, was laid to rest next to Shackleton, his friend and Boss. The grave of the Argentine Felix Artuso (died 26. April 1982) reminds us that South Georgia was anything but a peaceful nature paradise during the Falkland War. This is where the first shots were fired. On the way from the shore to the cemetary, you will pass groups of Elephant seals, Fur seals and you are likely to see the endemic South Georgia pintail. And now, as the rats are removed from the area, we should soon be able to observe the first South Georgia pipits there, too! 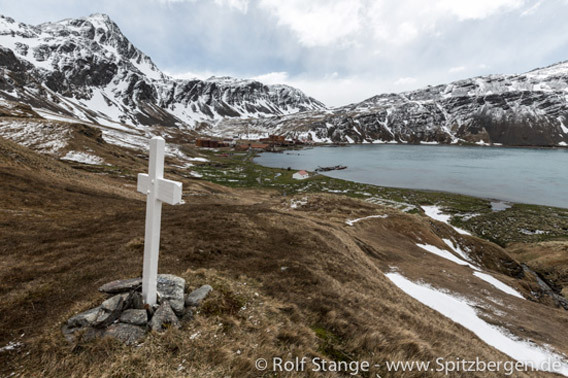 There are two white crosses on the green slope above the cemetary of Grytviken. The lower one is from November 1911 and reminds of Walter Slossarczyk, third mate on board the Deutschland, the ship of the second German south polar expedition led by Wilhelm Filchner. Slossarczyk, less than 24 years old, went on a private rowing boat excursion in the evening of the 26th of November. He would never return. The boat was found drifting in Cumberland Bay, not far from Grytviken, three days later by a whaling boat, but no sign of the man. He was never found, and his exact fate remains unknown. His comrades erected the memorial cross above the cemetary, at a place with a beautiful view over King Edward Cove. The second cross, slightly higher up the slope, is of Argentine origin and dates back to the days of the 1982 war. The old whaling ship Petrel is beached on the shore at beginning of the whaling station area as you come from the cemetary. In the days of whaling, dozens of large baleen whales were killed every day from ships like this one and pulled to the whaling stations. Today, the old harpoon points inland, it will never do any harm anymore. On the far side of the whaling station, there is an old building that used to be workers’ accommodation. Larsen was wise enough to build it with some safety distance from his own home, the manager’s villa (today the museum). Now penguins are keeping an eye on the old barack, not far from the technical installations used to process whale oil. Grytviken ist the only one of South Georgia’s whaling station that visitors can see from close distance. The other ones are closed due to the hazards of asbestos and collapsing buildings, a minimum distance of 200 meters from land and sea is mandatory. 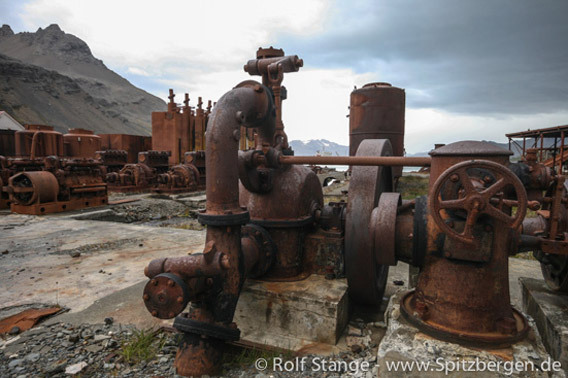 Grytviken is the only station that has gone through a thorough clean-up. The modern whaling that was driven in and from Grytviken from the founding in August 1904 went on with steam ships and explosive harpoon guns and let the whales little chances to win the fight. Every day during the season as long as the weather allowed work at sea, dozens of large balleen whales including Blue, Fin, Sei and Southern Right whales were brought into the bay to be processed on shore. At times, the stations were running at the edge of their capacity. The whales were pulled up the flensing plane to be „flensed“ or cut up to be boiled into oil. 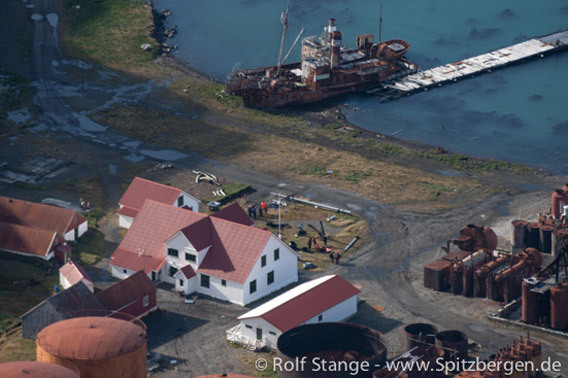 Several hundred workers lived and worked in Grytviken, which was used from 1904 to 1965, making it both the first and the last whaling station operating in South Georgia. An old whalers’ saying was: „Beyond 40°S is no law, beyond 50°S is no God”. But obviously, they did believe even in those latitudes, as they built a nice wooden church, Scandinavian style, in Grytviken, on 54°S. The old whaling stations were not made to last forever: already when he founded Grytviken in 1904, Carl Anton Larsen knew only too well that the whale populations would not stand the over-exploitation for more than a few decades at best. So it was clear that the investment should not be too large. But the church is a bit different than the rest. It was not just quickly put together, but built nicely and well in 1913, exactly one hundred years ago at the time of writing. It is still in good condition and occasionally used for the original purpose, for example at Christmas. There are two smaller, separate rooms in the back of the church. One has the old library, still with the original stock of Norwegian books. Obviously, old Larsen appreciated at least some education and basic ethics amongst his workmen. Today’s museum used to be the manager’s villa, in his days Carl Anton Larsen. Larsen was Captain of the Antarctic, Otto Nordenskjöld’s ship during his famous antarctic expedition (1901-03). During this expedition, Larsen had recognized the potential of the South Georgia waters for whaling and he had found a suitable natural harbour in Grytviken (the bay is now called King Edward Cove). Being the energetic man he was, he started with the new whaling station soon after his adventures with Nordenskjöld, in August 1904. He knew well that the whaling adventure was a drastic over-exploitation of the natural resources of the Southern Ocean and that it was only to last a few decades. The first part of the museum (or the last) that you may see as you visit is a smaller neighbouring building housing an exact replica of the James Caird, the famous boat used by Shackleton, Worsley, Crean, McNish, McCarthy and Vincent from 24 April to 10 May 1916 for their legendary crossing of the Southern Ocean from Elephant Island to South Georgia. When you see the James Caird in Grytviken, then you have most likely shortly before done a much faster crossing on a much bigger ship and yet, it may have been uncomfortable enough. It is and will always be hard to believe that Sir Ernest and his men accomplished what they did. It certainly took them great nautical skills, courage, and of course a lot of luck. And … endurance. 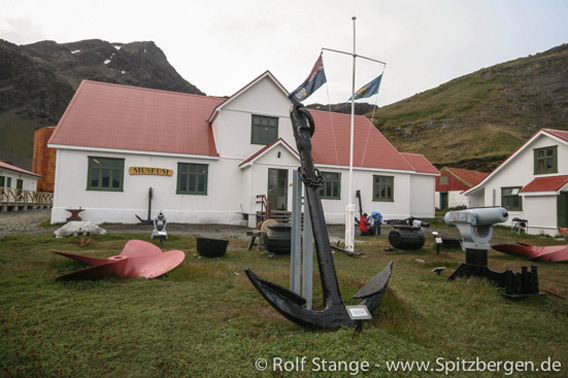 The famous whaling museum in Grytviken is definitely amongst the most beautiful and interesting museums of the southern hemisphere. It was founded in their days by Nigel Bonner and Tim and Pauline Carr, the famous sailors and adventurers. The individual exhibition rooms inform about the history of South Georgia from sealing and whaling through scientic exploration to … of course … Shackleton, and there is a great deal about the wildlife and nature of the island. The museum shop alway enjoys great popularity for several good reasons. Not only is it the first and last chance to spend money for more time than most of us are used to. And they do have a lot of nice stuff! From T-shirts and other clothing with appropriate motives to the mandatory postcards and other usual (but nice!) souvenir stuff to really interesting books, maps etc. And with every purchase, you support the South Georgia Heritage Trust with its Habitat Restauration Programme, that is getting rid of the rats in South Georgia, giving the island back to the original population of some 100 million seabirds. So, get your credit card out (yes, they do take plastic money) and buy some presents! This virtual visit is free. So is visiting the museum once you are there. But getting there isn’t, unfortunately. Thank you for this beautiful and informative website. I learned so much by taking the virtual tour and would love to visit South Georgia someday! Wonderful…just like when we were there but without the hustle and bustle. Could you get the other side of Shackelton’s grave marker? That was most poignant. The last frame of the virtual tour needs correction to toothfish (not tootfish). Thanks! A wonderful bit of nostalgia for me! Visited in 1999 as a sixtieth birthday peresent to myself and fervently wished to revisit-but health & mobility have taken their toll. So this virtual tour has been a real treat. Everything looks so well refurbished and clean. Well done SGHT and well done to Team Rat who have ensured the continuation of SG’s birdlife.